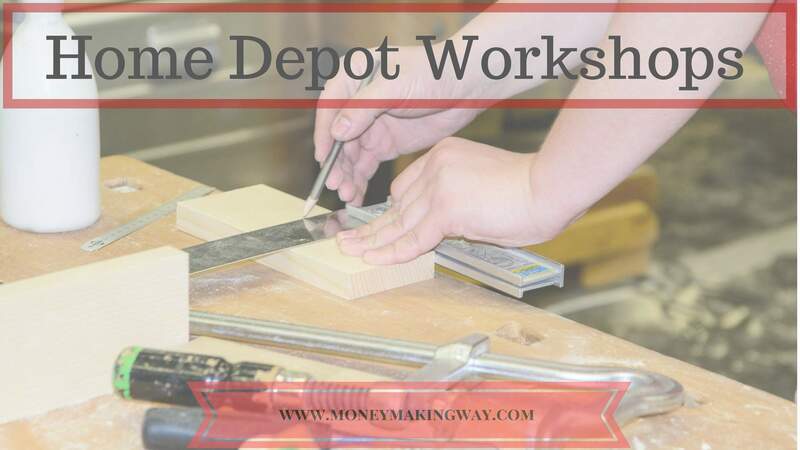 What is Home Depot Workshops? These are the free workshops that groom your skills by doing small tasks like build a handy pencil box, Installing light fixtures, installing a toilet, harvest yard sign, installing wall tile, and partnerships. These are designed for all ages and genders, kids workshops provide a lively environment to improve their skills by doing innovative works, whereas women’s get the chance to hone their skills by doing home improvement projects. This saves lots of money which are spent to manage our home and on paid classes for our kids. This would be great for those who want to save money or prefer the frugal living life style. And what is the harm of saving money if we are getting something free? Home improvements is that area where we spend significant amount yearly. If we can save those bucks by attending free home depot workshops the same amount can be utilized for something better. You perform these task under the supervision of experts with free available kits. Home depot workshops are available for all genders and ages and they are categorized in three categories. Following are the classes available for masses. These classes are for adults and do not require any specific skills to join. classes are performed under the strict supervision of experts with all the equipment. Following are the task you will find under this category. Here you will learn how to install a new light fixture or replace with an old one. you will also learn how to replace a standard light switch with a dimmer switch. This will let you know how to set up a new toilet by using tools and supplies. not only new one but also help you to know how to remove and fix the old toilet with new one. This could be little hard as compare to other two but can also help you to save lots of money. the workshop will show you the tools and supplies which you need to complete the task. An associate will guide you how to prepare all the things before initiating the tiling and how to mortar and seal tile like a pro. This one is only specialized for kids to sharpen their skills. Kids ages between 5 to 12 can join kids workshops held on every 2nd Saturday at all home depot workshops. Following are DIY classes you will find under this category. Kids have to build and decorate pencil box with the available kit. Children must be available for the workshop in order to receive the supplies. once the pencil box is built then kids need to decorate it. And they also going to receive the free Certificate of Achievement. Here kids can also make things which can help you for home improvements. Building a bird house and picture frames are also part of home kids workshops. This not helps you to save money but also sharpen the skills of your kids at very early stage. This one is majorly organized for women’s which mostly includes home improvements. Following are the activities involved in Do it Herself classes. Here women’s will get the chance to build yard signs. Experts will teach you how to use carpenters tools to measure and cut the wood. They will also demonstrate the safe use of tools like jigsaw, drills, and clamps. At the end of the workshop, the expert will help you to shop for everything you need to create your own project at home. This will help you to build chicken coops plan for any sized yard. This will provide you safe and warm place for your chickens. These types of small projects are easy to work and help women to save money. How to get enroll in Home Depot workshops? If you are looking home depot workshops near your area. Click on the given link and this will take you to a page where you need to enter the zip code of the area for workshops. Now the next step is to select the area of your choice and it will take you the types of upcoming workshops. Next is to click on register and provide your name and email ID. Now you are registered for the workshop. Visit the home depot workshop on schedule date and time. Workshops available in one area can be different to other. And you might or might not find the same types of workshops in the given area. It helps to increase the social interaction as one project have multiple people involved. So if your kid is working on a project with other kids of your area it helps him/her to more socialize. It helps kids to follow the direction. Each project involves step by step process which helps kids to learn how things are structured and made before reaches to the stage of the final product. The more and more workshops you involve it increase your problem-solving skills. usually, our brain works according to our need and uses. If we are solving problems on daily basis it enhances our problem-solving skills. As soon as your child completes a couple of projects it boosts their confidence and as a result, they become more independent. Workshops also help us to be more creative as I discussed earlier. The brain has the power to work according to our need. If you are doing creative work on a daily basis it helps your kids to be more creative in all aspects. If you work on some significant project like tiling, Carpenter, and fixing electronic items. it helps you for home improvements and also saves money. Home depot workshops are free and available to all kind of ages and genders. This can be helpful for frugal living to save money and simultaneously sharpens your skills. But free workshops are limited and you can only learn what is offered to you not what you want. But it’s still worth attending these types of the workshops. Eventually, it’s adding value to your life and helping you to learn some special skills which will be lifelong.